The weather could not have been more perfect for the first two days of the Oakcliff Sailing Advanced Match Racing Clinic. Yesterday was all about boat handling and getting to know the boats and the positions. Today we were mixing it up with the great help of umpires and race committee. The drills that Dave designed were run with precision and very very little down time. 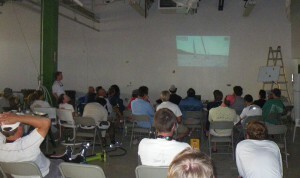 After a long day in the 15 knots of wind and near 80 degree temperatures, the cool of the boat shed was a welcome place for a video debrief. Still two more great days of sailing to look forward to!